Make sure the don’t have any soft spots and mold. Also, don’t forget to look underneath and press the pumpkins with your thumbs. If it feels squishy, the pumpkin is not fresh. Choose a lighter colored pumpkin, because pumpkins continue to ripen and will get more orange after they are picked. Pick one that is lighter and you will have a perfect deep orange one by Halloween. 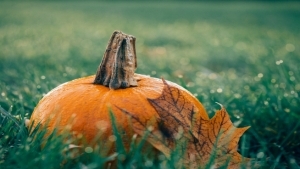 Pick a pumpkin that has a dark green stem that is still attached. If it is brown, it is an older pumpkin. Want the perfect pumpkin to carve? Find one that has flat walls and no deep ribs. Also, skip the tall, funny shaped pumpkins because they have skin that is harder to cut thru. When you find the perfect pumpkin, set it on a table that is flat to make sure it will stand straight.